Tight integration with Cloudera Impala, making it a good, mutable alternative to using HDFS with Parquet. A tablet is a contiguous segment of a table. A given tablet is replicated on multiple tablet servers, and one of these replicas is considered the leader tablet. Any replica can service reads, and writes require consensus among the set of tablet servers serving the tablet. A tablet server stores and serves tablets to clients. For a given tablet, one tablet server serves the lead tablet, and the others serve follower replicas of that tablet. Only leaders service write requests, while leaders or followers each service read requests. Leaders are elected using Raft Consensus Algorithm. One tablet server can serve multiple tablets, and one tablet can be served by multiple tablet servers. The master also coordinates metadata operations for clients. For example, when creating a new table, the client internally sends an RPC to the master. The master writes the metadata for the new table into the catalog table, and coordinates the process of creating tablets on the tablet servers. 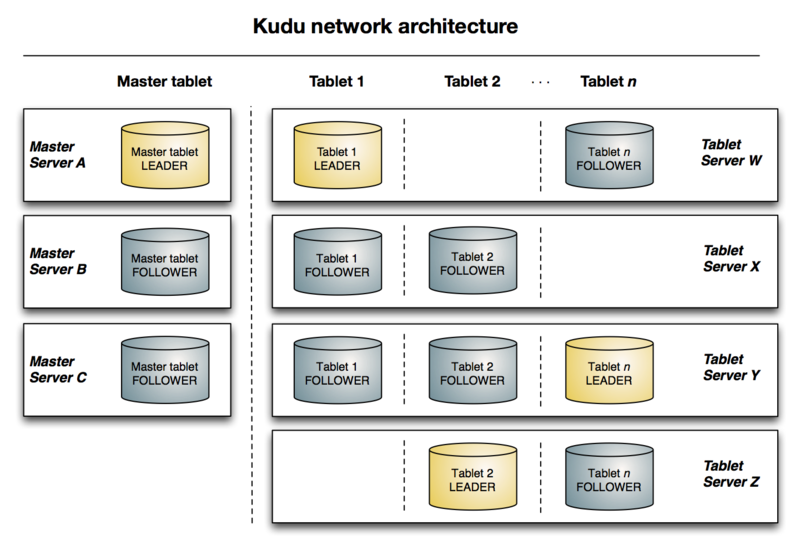 The catalog table is the central location for metadata of Kudu. It stores information about tables and tablets. The catalog table is accessible to clients via the master, using the client API. Kudu replicates operations, not on-disk data. This is referred to as logical replication, as opposed to physical replication. Physical operations, such as compaction, do not need to transmit the data over the network. This results in a substantial reduction in network traffic for heavy write scenarios. Multiple masters are not supported during the Kudu beta period. In the past, you might have needed to use multiple data stores to handle different data access patterns. This practice adds complexity to your application and operations, and duplicates storage. Kudu can handle all of these access patterns natively and efficiently, without the need to off-load work to other data stores. Data analysts often develop predictive learning models from large sets of data. The model and the data may need to be updated or modified often as the learning takes place or as the situation being modeled changes. In addition, the scientist may want to change one or more factors in the model to see what happens over time. Updating a large set of data stored in files in HDFS is resource-intensive, as each file needs to be completely rewritten. In Kudu, updates happen in near real time. The scientist can tweak the value, re-run the query, and refresh the graph in seconds or minutes, rather than hours or days. In addition, batch or incremental algorithms can be run across the data at any time, with near-real-time results.